I don’t want this to be maudling or self indulgent but today sees the funeral of Charles Kennedy who, to my mind, was a visionary and a hugely significant political figure of the last thirty years. His opposition to the Iraq war when everybody else was blindly following Blair and Bush into war and his opposition to Nick Clegg’s far too cosy coalition with David Cameron in 2010 both proved to be seminal. 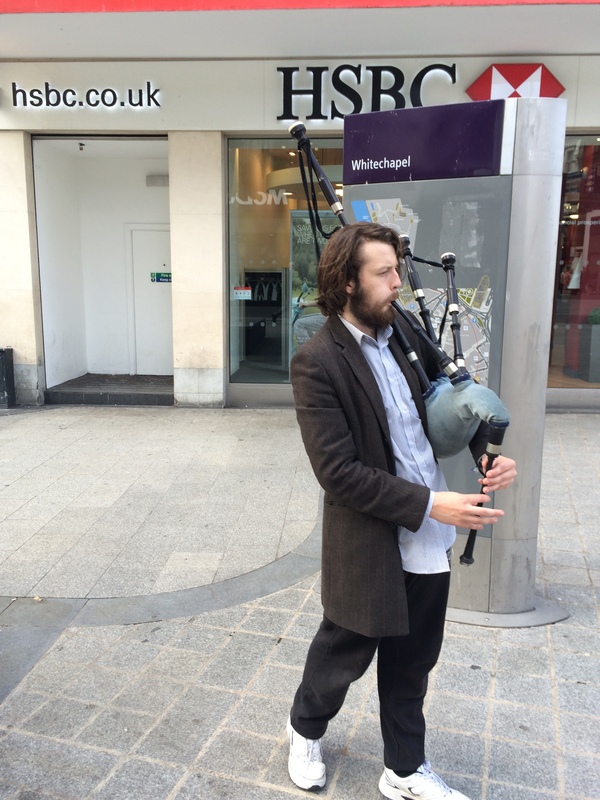 ‘Anyway’ – as they say – ten days ago on the day of Charles’ sudden and untimely death, I was shopping in Liverpool city centre when I heard the sound of a piper playing bagpipes. I’m not a natural fan, but it just seemed appropriate and right on that Tuesday. Thirty minutes later he was there again on Whitechapel. The piper was packing up. I went over and put some money in his case. My little site here is supposed to be about chasing ‘social norms’. I don’t know about that but what I do know is that our social world revolves around ordinary, everyday interactions. Everybody has a story. A tiny part of this guy’s story is that he is a ‘Scouser’. He is not Scottish, neither is his dad, nor his grandad who taught him the bagpipes. When I said it was appropriate he was playing today on the day of Charles Kennedy’s death, the young man didn’t know who Charles Kennedy was. I just said he was a leading light in the Stop the War campaign. The young man’s reply was ‘Well. He is good enough for me. I will play him a lament’. As I walked away, the sound of this haunting lament filled the unwatching Liverpool street. Thank you Mr Piper man. and thank you Charles Kennedy. ‘Joy’ – the middle name of a dear friend in the 70s. ‘Joy’ – according to Buddhism the quality associated with Thursday born children – the day of my birth and one other ‘joyful’ person of my acquaintance. ‘Joy to the world’ – it’s Christmas! – no it’s not, but yes it is in my world and that of at least 20,000 people with whom I shared Sunday evening. I know; ‘it’s only football’, but it’s so much more than that. ‘It’s only football’ comes nowhere near describing the all-consuming, passionate joy that comes from seeing your team immerse themselves in success after many, many years of stumbling failure and unfulfilled promise. Football is a cohesive force that unites communities and brings love to the people, or perhaps that’s only my belief. Okay – time for a bit of sociology. Emile Durkheim claimed that religion was a cohesive force that provided social integration and moral regulation. In our secular society, football has perhaps replaced religion in providing these functions. To be a true football supporter is to have complete loyalty to your club for life and accept the ethics associated with being part of that community. Try swapping your support to a rival club and see what happens. A certain amount of admonishment may come your way. In an earlier post I referred to the Buddhist idea that while all of life is suffering, the ultimate goal is enlightenment. PNE 4 Swindon 0 may not be nirvana but it felt pretty, damn close on Sunday. We Preston North End fans can now look forward to next season joyfully. 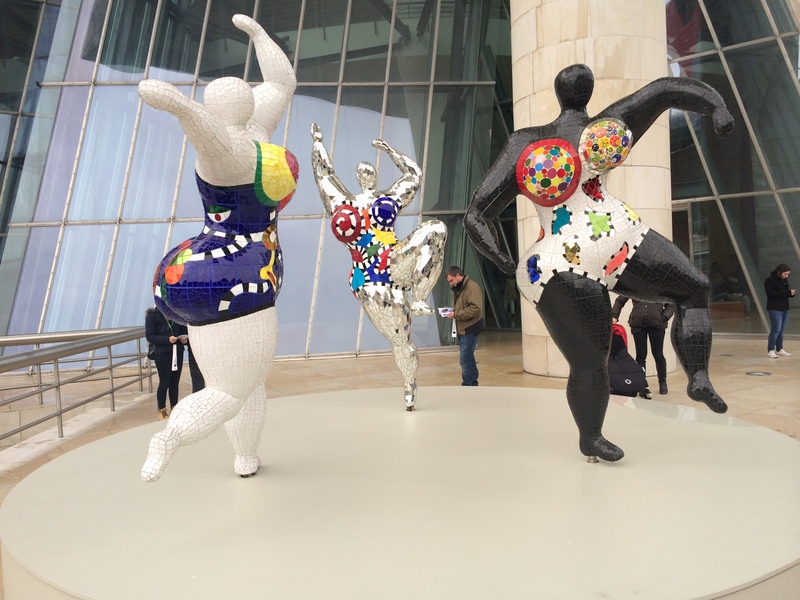 Beautiful Bordeaux – do you believe in angels? Grabbed a three day trip to Bordeaux to catch a football match between FC Bordeaux (Les Girondins) and Nantes and eat at L’Entrecote. 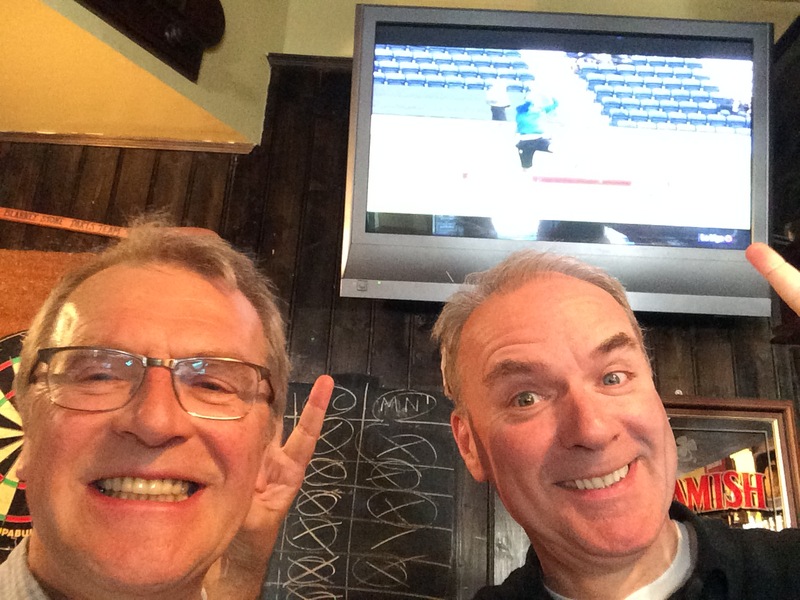 The trip was inspired by my friend Martin Baker – whose latest novel, ‘Version 13’ is very, very good and worth checking out. L’Entrecote is a celebrated restaurant in the centre of Bordeaux where only two questions are asked of you: ‘How do you want your steak?’ and ‘What would you like to drink?’. No a la carte. First course a light green salad. Main course steak and chips. As well as providing superb food (and wine), L’Entrecote is an alive restaurant with smiling, attentive serving staff. The whole experience is a delight. Also, for the indecisive, it takes away that sometimes tricky thing: choice. Smiley, engaging people bring you lovely food, even down to extra chips in the style of British breakfast café coffee refills. The first of my Bordeaux angels was La Madam who granted us entry to the restaurant. You can’t book. You queue. Average queuing time about 30 mins. Facing this slightly formidable Madam, we are all children back in school praying the dinner lady will let you in. Once inside, this is not school. It’s great. If you get chance, go. It’s next to Le Grand Theatre. Its not expensive; 35 Euros including wine? 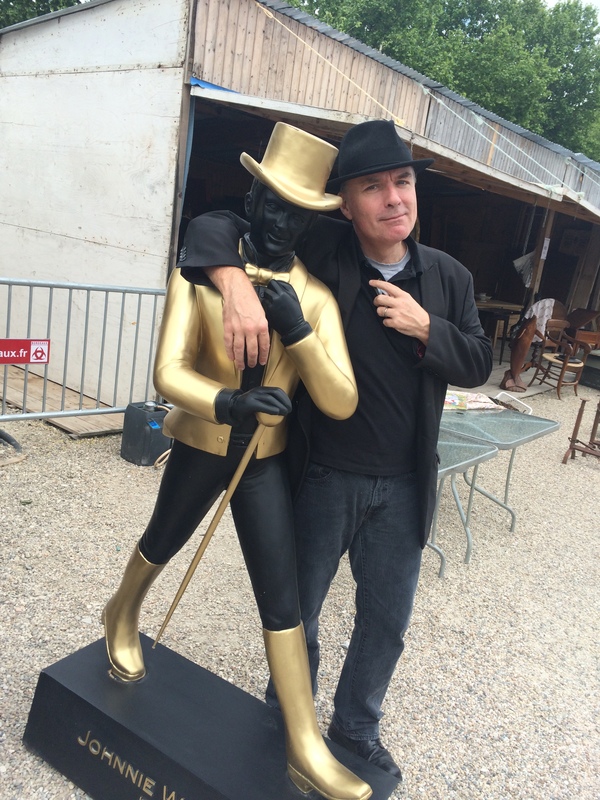 None of Beautiful Bordeaux could have happened for me though without these guys – my definite angels. 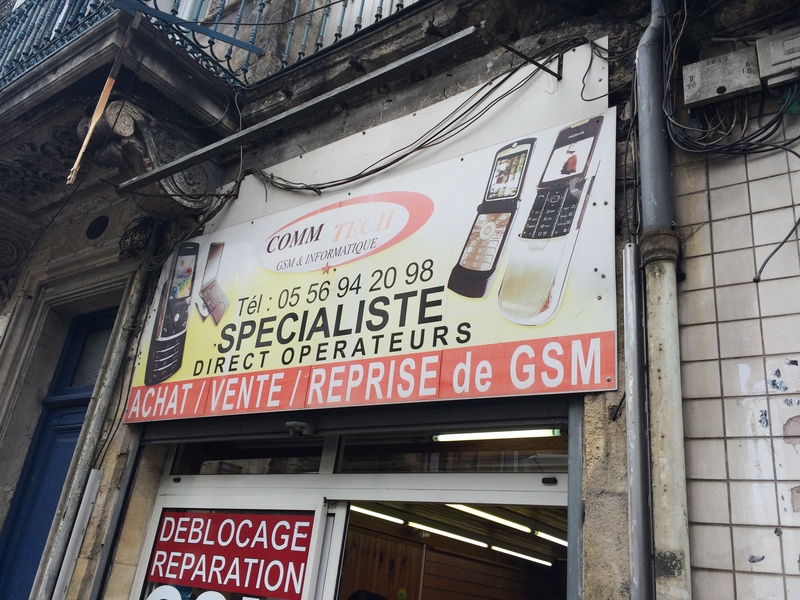 I had iphone issues and these guys solved it with style, grace and great banter. iphone technology could replace English as the language of international diplomacy. The weekend would not have happened without the intervention of my friends above. 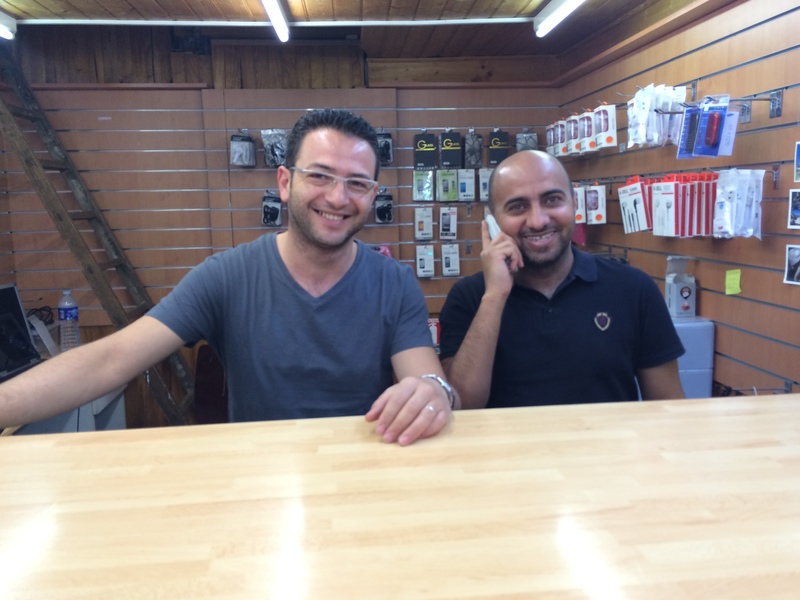 An hour in their shop was worth a hundred journeys; laughing and interacting with their customers as my phone was slowly brought back to life. What topic started the conversation flowing? The guys’ interest in the arrival of our latest Princess – Charlotte. Or, perhaps I have a look of a middle aged, British Royalist who would love to rejoice in my country’s royal lineage while travelling abroad? Seem a nice family though Wills, Kate and their two kids. Whatever – merci mes amis. On continue. Without a fully functioning iphone I wouldn’t have found Martin which I clearly did. Here is Martin faithfully playing the role of a middle class English man who has just dined at L’Entrecote. 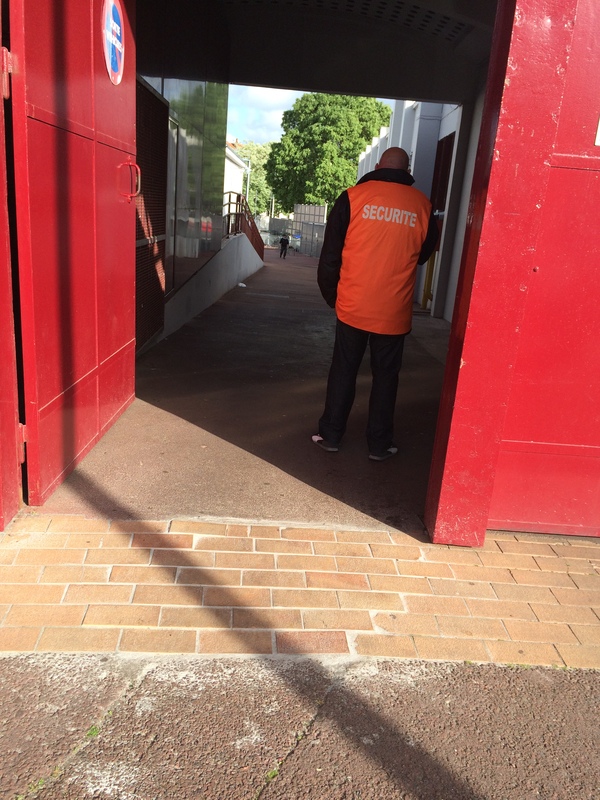 Nearly an angel – security guard who could not quite provide entry to the Bordeaux v Nantes game. But it wasn’t his fault we had chosen to see the final ever game at Bordeaux’s Chaban-Delmas stadium which was a sell out. 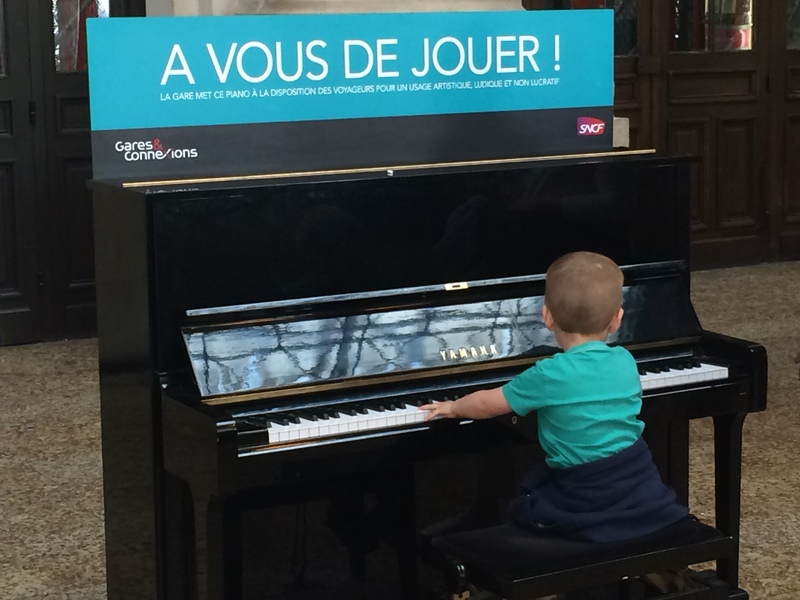 Definitely an angel: this little boy let me have a go on the piano in the magnificent Bordeaux station. I’ve always wanted to play one of those public pianos. My choice of music – Heh – Elvis. ‘Can’t help falling in love with you’ – my beloved PNE were kicking off in a few hours time with a place at Wembley at stake. You do feel a bit bad elbowing a little child off the piano but kick off was approaching and Elvis couldn’t wait. 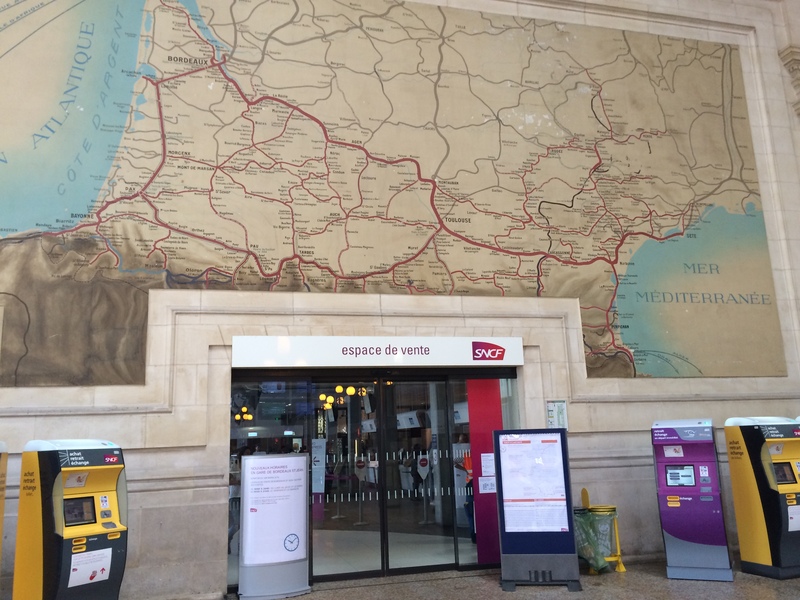 That’s what you call a railway station with a little handy map of their region. Three Scottish angels? 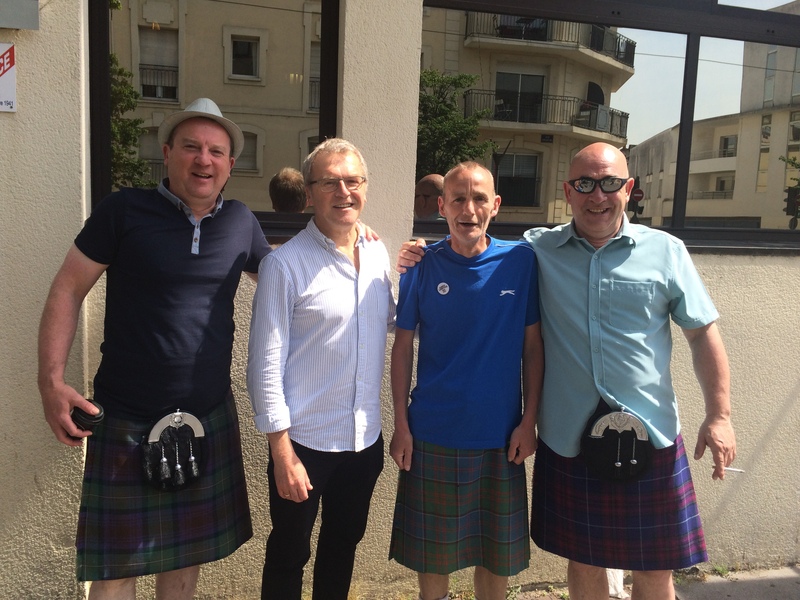 One day after the General Election and the SNP have sent an expeditionary force to Spain to annexe Aquitaine? Come on Nicola, give it a rest girl. Mind you, would love to see my three friends here sharing a beer with Nigel Farage as he outlined his UKIP perspective on what he sees as the ‘Scottish question’. I’m not sure what the question is but I’m fairly confident of their answer. Incidentally, they did get into the stadium: it’s a Scottish thing. 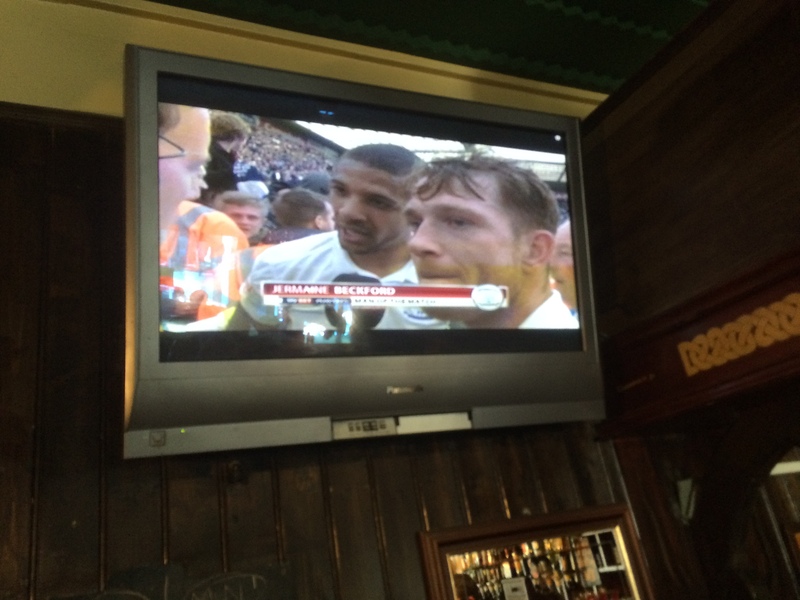 Two clear, unadulterated angels of the weekend: Messers Joey Garner and Jermaine Beckford of Preston North End whose wonderful 3 goals saw Preston North End proceeding to a Wembley League 1 Play Off Final on May 24th. Oh Joey Garner, you are the love of my life, Oh Joey Garner, I’d let you…..’ Tune in on May 24th at 5:15pm for the rest of this little number. Finally, two harmless, idiot angels who travelled a 1000 miles for a match for which there were no tickets but who worshipped Preston North End’s road to Wembley in the wonderful city of Bordeaux. Allez les Blancs. When I say ‘we’, this is essentially a personal call out to the two souls who are following my blog. I know you value your privacy and so will not be named, but rest assured that you are both in pole position for winning the inaugural ‘The Social Norm Follower of the Year’ award. 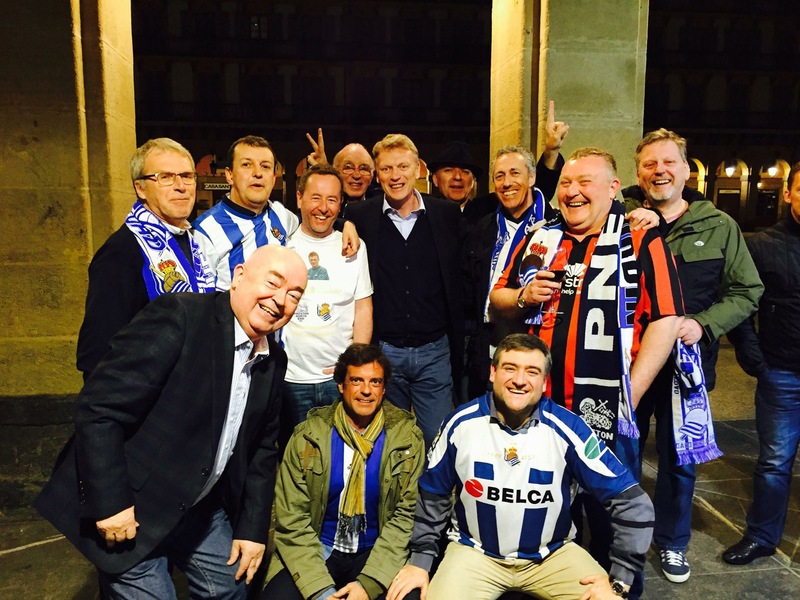 ‘Guys’ – I’m not sure where you were, but if I recall, I was in Bilbao making my way to Donostia San Sebastian to meet up with David Moyes and my new-found Real Sociedad friends. When I say ‘meet up with’, it was more of a sort of an orchestrated ‘bump into’ with the help of a mutual friend of mine and David’s. You may spot him in the photos below. Responding to constructive feedback from the two front runners in the SNFOTY competition and their close friends, here are some pics of my afternoon at the Guggenheim. 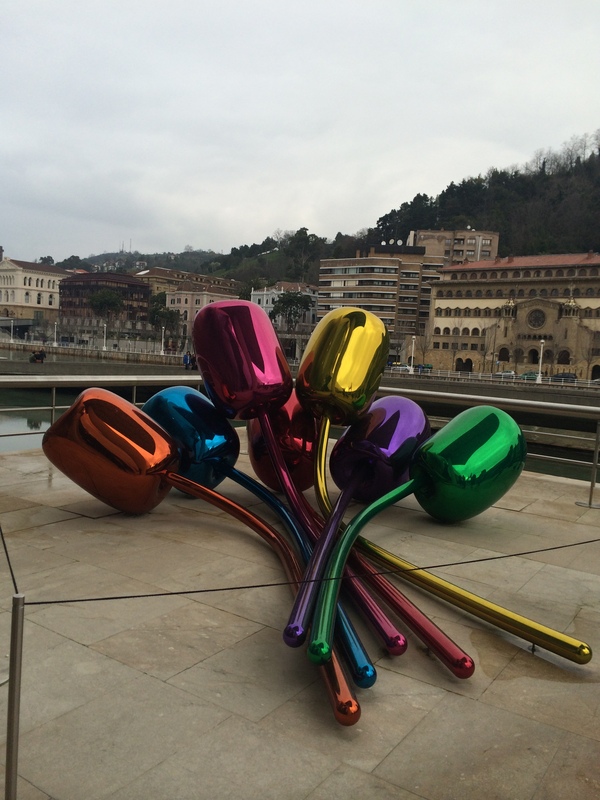 And then onto San Sebastian. My La Real scarf also doubles as a picnic blanket. It really was a great night for people who love football, fine food and wine and growing Anglo – Spanish friendship. At the time of writing, it’s a tense time for many football fans and certainly for Nob Enders everywhere. ( Apologies – this is turning into a 1990’s Football Fanzine.) ‘Nob Enders’ are supporters of Preston North End; founder members of the Football League, the Invincibles of 1888-89 and the source of my understanding of how personal growth can come from suffering. Buddhist mindfulness practice has taught this truth for centuries. Hey guys – take a shortcut to enlightenment through suffering, follow Preston North End. Let’s test 4 years olds – err – perhaps not. Okay you parents and grandparents out there. When your 4 year old starts school in September 2015, this crazy government wants your child to be ‘tested’ – one to one with a teacher. When this was tried in Wales (and defeated by Welsh teachers), the handbook accompanying the testing process was 148 pages long. The result of the ‘test’ is electronically sent to central government and stored to measure the child’s progress, the school’s performance and individual teacher’s performance. The first few weeks of a child’s start in school should be about learning to settle into this new world. They need reassurance; care. They need to be happy!! At the NUT Conference today in Harrogate we voted to boycott these tests. I hope you agree this was a good decision. Joy should lie at the heart of early years education. Children need to discover the joy of learning, not the trial of testing. 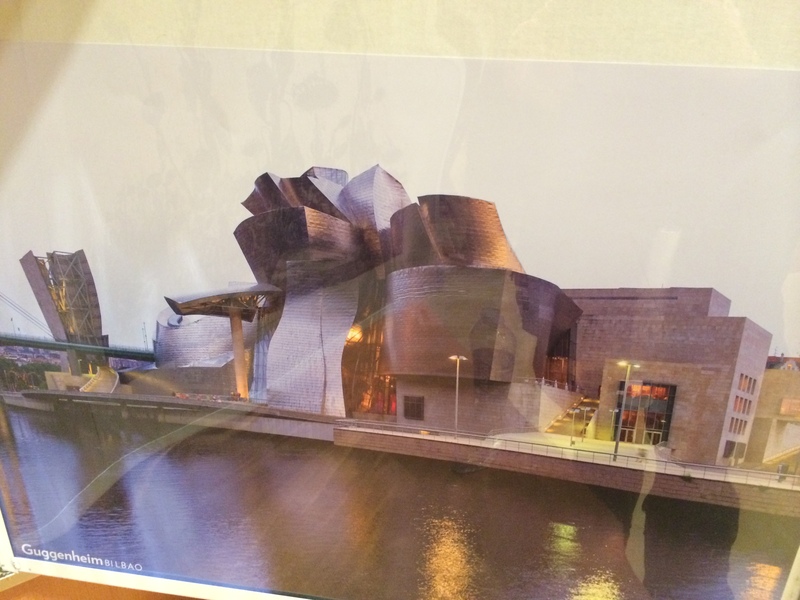 Last Friday night – seven days ago – I was having a beer in a café/bar in Basque Bilbao, Northern Spain. I’d flown from Manchester, spent a great couple of hours at the Guggenheim and now had 20 minutes to kill before catching my train to the utterly delightful San Sebastian 60 miles up the coast. In the café, every individual was sitting at tables, all facing the window and the road outside. I sat the opposite way and so was the only person sitting facing about 9 people all looking in my direction but no one was looking at me. Their eyes were fixed on the scene outside. Across the road were two ambulances and lying on the pavement was a motionless, elderly figure. The bar occupants were silent and fearful for the poor man/woman on the street. It was difficult to tell whether it was a man or a woman. I was not studying the scene. It struck me at the time that this group of silent, staring, respectful, elderly people were, to some extent, contemplating their own mortality whether consciously or unconsciously. The fact that I had a few years advantage on my fellow diners was no excuse for me not joining them in contemplating my own mortality. 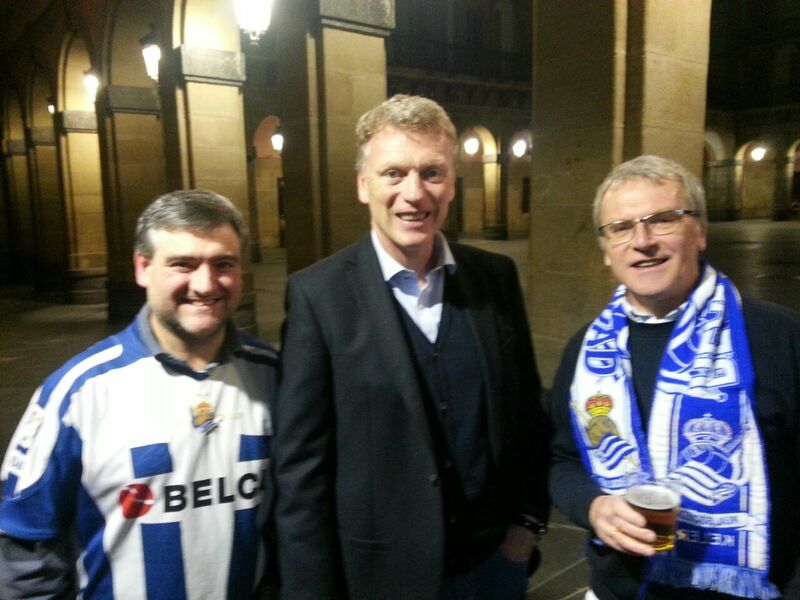 I didn’t however and went on my way to San Sebastian for 3 magnificent days with Spanish and English friends, all more or less united by Preston North End and Real Sociedad in general and David Moyes in particular. I’ll let you readers sort that one out, or ask if unsure. Seven days later, there will be very few who have not considered their own mortality and the mortality of others given the awful, appalling, tragic and undeserved suffering of the victims of the German Wings catastrophe. I am writing in the beautiful South West France making my way back to the UK staying with friends along the way. Perhaps the last seven days has put into sharp focus ‘carpe diem’ which can sometimes appear as a cliché but is nevertheless true for all that. In my former profession, I accompanied groups of students to Auschwitz as part of holocaust education. As our plane approached Manchester on our return, Holocaust educators more experienced than me urged us to live our lives fully and with joy. I feel this is a truth we should mindfully pursue. That wasn’t too easy to write, I hope it wasn’t too difficult to read. 4 years waiting and I get the plot from Bread. 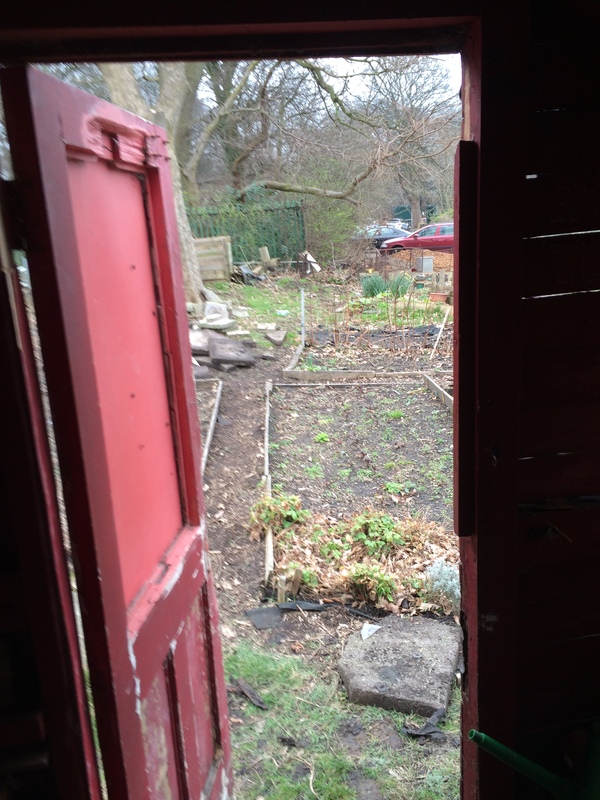 I am now the proud owner of Freddie Boswell’s shed where he wooed Lilo Lill. Part of Liverpool’s rich cultural history.